Since its founding from 2007, HAOTIAN has become part of the daily life of more and more cooks worldwide, whether they are seasoned chefs or novices. HAOTAN matches all their cooking habits, with products that consistently combine elegant and contemporary design with excellent culinary performance. 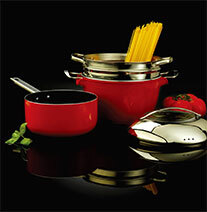 Offering excellent value for money, HAOTIAN sells a wide variety of cookware that meets the requirements of all consumers. From frying pan and casserole, saucepan, wok....etc. HAOTIAN has an affordable solution for every taste and budget! Space-saving storage methods, multi-purpose and durable products with an eco-friendly approach, there is always our products that will meet your customers'expectations. We at HAOTIAN believe cooking is not about eating, it is about living healthy, family and close friends sharing valuable time in the kitchen together. It has always been our intention to deliver the best cookware and accessories to enhance those experiences through innovation, technology and style. The Eco-logic by HAOTIAN philosophy is not just about non-stick coating,ceramic coating... it is about the total environment of saving energy, efficiency and time. This is the message HAOTIAN believes strongly in when developing our products, with our employees and the processes we manufacture our products within our factories. The environment is a precious commodity, one we are all striving to maintain. The introduction of non-PFOA & non-PTFE coatings and green processes is a step in that direction. All of our products that contribute to a better and cleaner environment are recognizable by the green Eco-logic by HAOTIAN logo. The logo consists of the round patten and green color of the grass , thus symbolizing our concern for both the environment and people in peace around the world: our factory workers, our employees and you, our customer. HAOTIAN guarantees the implementing of the quality management system that allowsresponding effectively to the customers' requirements and ensure their satisfaction, both inproducts they buy and service received. Also, HAOTIAN is aware of its responsibility to society to minimize the impact that its activity may generate in the environment. Nowsome big customers, such as Wal-mart, K-mart, Kohl's, OSTER, Big Lots, Tognana..etc. have long- term cooperations with us.... Quality is our pursuit all the time! Yours comment is our best way to improve the quality of the products and enlarge our business..